Flat Feet in Kids: What's Normal and What's Not? The term flat feet gets thrown around a lot. We know (or think we know) that’s its problematic for some adults, but may be normal for some kids. Let’s take a closer look at what it means to have flat feet, so you can more clearly understand when this common condition requires treatment, and when it’s something your child will simply outgrow. When is a Foot Considered Flat? A flat foot is simply one with a collapse of the arch. There are flexible flat feet: when sitting, the child has a good arch but upon standing the collapse is apparent. There are also rigid flat feet. These are a whole other ball game; they are typically present from birth and are non-reducible. This means that, no matter how hard we try, we cannot force the foot into an arched position. There are a number of conditions in childhood and adolescence that can cause a flat foot. They range from congenital abnormalities (those you are born with) to simple tendon weaknesses. While the arch of the foot is where most people look to see if a foot is flat, the orientation of the backs of the heels will also tell a lot of the story. There may be instability in this heel bone that is making the entire rest of the foot compensate and 'collapse' at various points. In addition, genetics may cause two bones to fuse together instead of creating a joint. When this kind of ‘coalition’ occurs, there is less flexibility and room for correction of this flat foot. Kids with a history of flat feet - meaning that mom, dad, grandma or grandpa have the same issue - are likely to inherit this same foot type. Similarly, a child with high arched feet in the family is likely to have high arched feet. The overall structure of the foot and the amount of pronation in the foot will dictate the pull of certain muscles and tendons in the foot which can lead to deformities such as bunions and hammertoes. It also can cause a variety of tendinitis, plantar fasciitis and can even predispose one to stress fractures. If you believe your child may have flat feet, a simple evaluation can help to determine if there is a need to treat this condition. Here’s the basic timeline we use to determine when treatment is appropriate or necessary. During the toddler years, a flat foot is perfectly normal. Flat feet at this age rarely cause pain. It is normal developmentally and typically does not need to be treated. By the time the child reaches kindergarten (5 years old) the arch should have begun to develop; his or her feet should no longer look so flat. Even during early elementary school, however, children with flat feet and no pain do not require treatment. 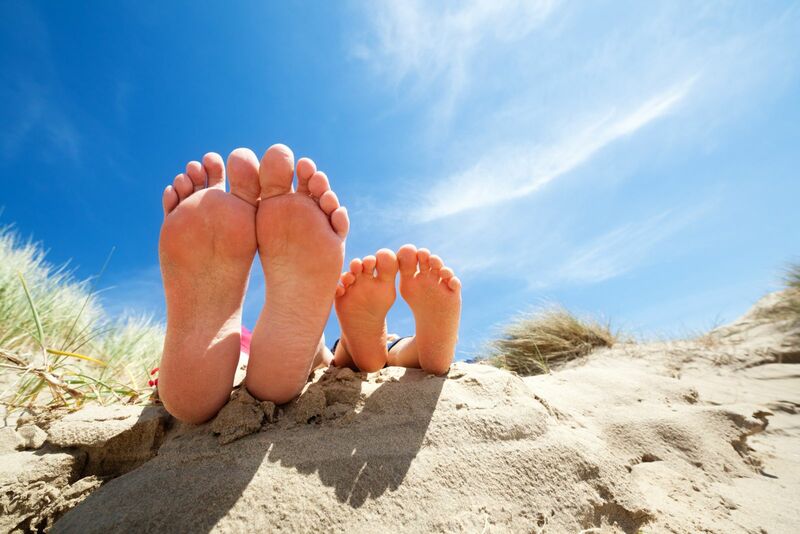 Only children who have other abnormalities, like bunions or hammertoes, should be treated by your podiatrist. Typically at this age, we suggest a custom-made orthotic. The orthotic will not change the shape of the foot. It will, however, put the muscles and tendons in the best possible position as the foot continues to develop, minimizing the risk of further problems. If the feet remain flat, children will typically begin to complain as they age. It's important to remember that kids don't always complain of pain! Often they will say their feet ache or feel tired. If you take a trip to an amusement park or are on vacation, the child may continually ask to sit down or want to stop walking. At its worst, children will not want to play with their friends and may begin to retract from sports and gym. Developmental flatfoot is often overlooked, even though it is one of the most common musculoskeletal abnormalities affecting the foot of children and teenagers. If they are flat, non-painful, and not deformed, then it is usually thought to be normal, but that is not always true! Because children are constantly growing and changing, conservative treatment is very effective. Treatment can include regular use of foot orthotics, physical therapy, and at-home strength, balance, and coordination exercises. While it is rare, some kids do not find pain relief with these less invasive options. In this case, we start to consider surgical options. There are two basic procedures: an arthroeresis and repair of the bones and soft tissues causing the flat foot. The arthroeresis is where a small 'plug' or implant is placed in the joint at the back of the foot under the ankle joint. In this procedure, the 'plug' is threaded in over a wire under a live x-ray exam. Once the arch has been re-created the implant is left in place. This procedure is only successful in flexible flat feet and sometimes requires additional procedures. The bony procedures and fusions vary vastly and are a very aggressive form of treatment that are only needed in the worst cases. Those can be further discussed with your doctor if they feel they are right for you. Thankfully, with early intervention, most children can avoid the most aggressive treatments and begin walking more comfortably. So watch those little heels and arches and bring your child into the office if anything looks or feels off as they grow and develop.